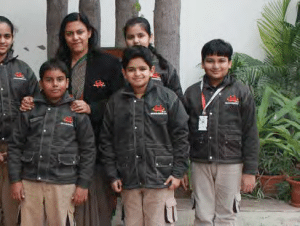 Pedagogy – Our focus has been on developing a school culture, one that fosters respect and humanity in school which the students carry to home, to the society and to the country at large. We have been aiming at physical and emotional safety and individual success of teachers and students. We have tried to shift focus from content to process and enhance collaborative learning and interdisciplinary learning. Infrastructure – For a student to excel in life we need to lead in a manner which trickles down to each student. Our policy of inclusive education has worked wonders with children. We have tried to empower children by giving them responsibilities where they learn decision making and problem solving. This has been achieved through student council members wherein they host and organise events, handle sensitive disciplinary issues and manage day to day routines. Technology – Our school has partnered with iCarnegie, USA Pittsburg which is an educational subsidiary of Carnegie Mellon University, USA. Students are provided with Robotics as a platform to learn Computer Science, Technology, Engineering and Math at junior, middle and high school level. The learning management system enhances the learning aspects both at school and home effectively. Teachers and students have access to latest technology with interactive smart boards along with projectors and laptops.